I recently purchased steel tubes for shaping homemade cannoli, and saw this as the perfect opportunity to try them out. We weren't crazy about the maple mousse filling (kind of reminded us of Van Wilder's special eclairs), but the cannoli themselves were great. 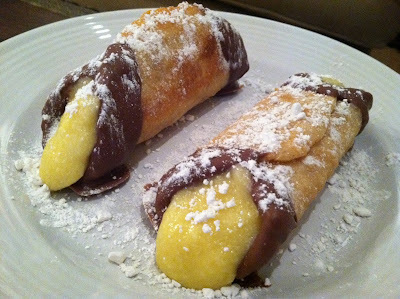 We'll be making them again soon, and will post with a classic ricotta cream filling. See recipes after the jump! 1. Put the flour, granulated sugar, 2 tablespoons of shortening, vinegar, 1 egg, cinnamon, and salt into a stand mixer fitted with the hook attachment. Mix on low-medium speed until well combined, approximately 10 minutes. 2. Remove dough from bowl and wrap in plastic wrap. Let rest at room temperature for 30 minutes - 3 hours. 3. Lightly coat the dough with flour and roll to 1/8-inch thick with a rolling pin or pasta machine. 4. Cut 5 inch long ovals from dough. Loosely wrap oval around dowel (we bought metal dowels from our favorite kitchen store) and brush one end of the oval with beaten egg. Pull the egg-brushed end over the opposite end, and press them together, sealing the shell around the dowel. 5. Heat vegetable oil in a pan to 350 degrees (Buddy uses lard, but the vegetable oil worked just fine). Carefully lower dowel into pan and fry until golden brown, turning with a slotted spoon. Use the spoon to carefully remove the dowel from the oil and transfer to a paper towel lined plate to cool. 6. When the shell is cooled completely, pull the dowel out. Fill with maple mousse (I'll do another post soon with the classic ricotta filling) and dust with powdered sugar. Your maple mousse cannoli's look amazing! I actually hosted a cannoli DB challenge back in '09. Love them! Fantastic idea!